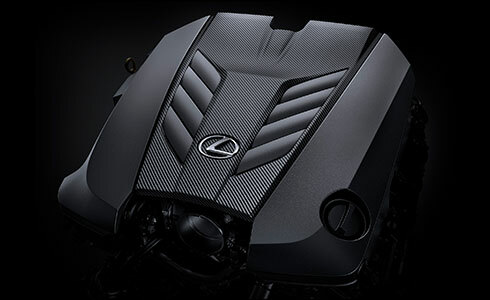 Feeding dynamic control for driving exhilaration, the close gear ratios of the advanced 10-speed automatic transmission realize equal intervals between gears and shifting, for quick rhythmical shift changes with a good tempo and upbeat engine sound as you accelerate through the gears. The wide gear ratio range enables powerful start-up acceleration, yet is exceedingly comfortable during high-speed cruising. 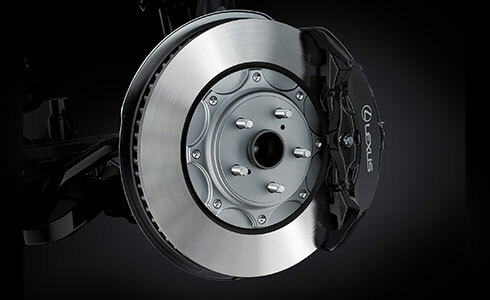 Large 20-inch disc brakes on the front and high-friction brake pads actuated by 6 opposed pistons on the front and 4 opposed pistons on the rear provide stable braking performance in diverse driving conditions. Monoblock aluminum calipers contribute to their light weight and excellent rigidity. 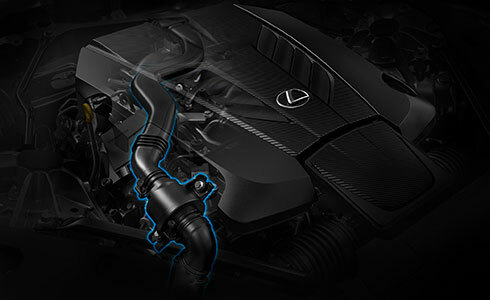 The sound generator and generator hoses utilize pulses in the engine air intake to generate and harmonize 3 different high frequency tones during acceleration, producing a highly distinctive and sporty engine sound unique to the LC. 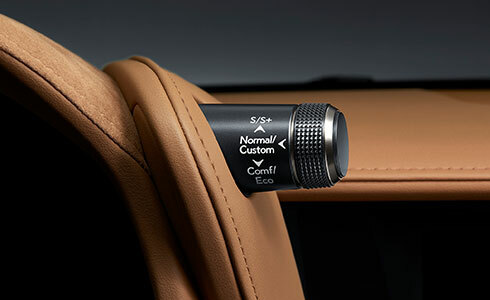 An aural experience in its own right, the vibrant engine sound is enhanced by special sound-control valves in the exhaust that activate during start-up, producing a localized sound image that projects a feeling of space and depth. 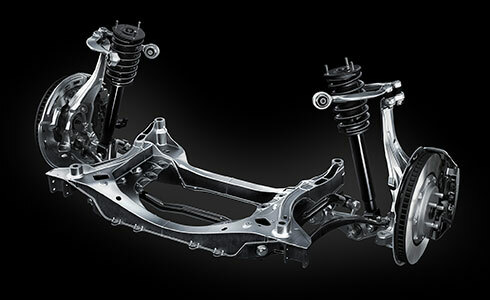 The design of the chassis was driven by a sharp focus on structural integrity to enhance the basic performance potential. Optimizing the layout and the use of aluminum and hot-stamp, high-tensile steel contribute to the lightweight, high rigidity body structure, reinforced by the use of body adhesives, laser welding and laser screw welding. 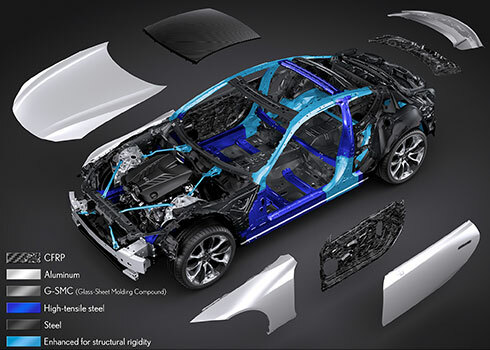 To further lighten weight and lower the center of gravity, aluminum and CFRP (Carbon Fiber Reinforced Plastics) are used for a variety of components. 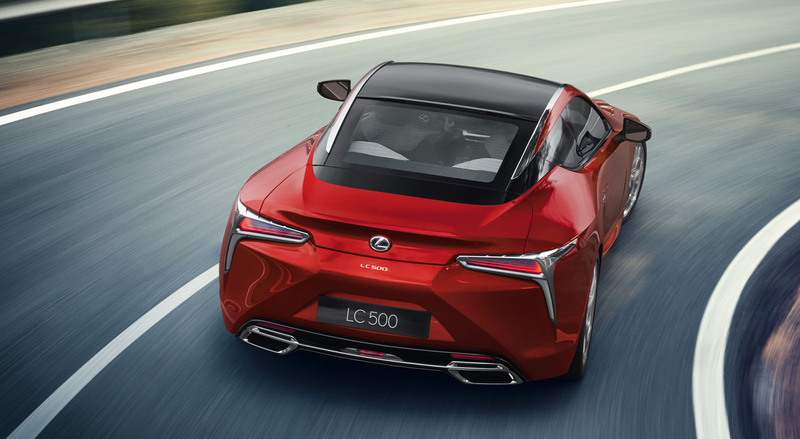 The innovative front and rear multi-link suspension features a double joint multi-link design which also enables the low hood line of the LC’s alluring silhouette. 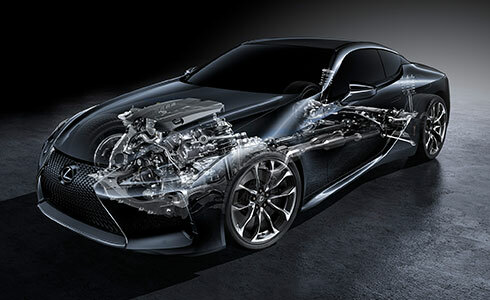 Optimal tuning and the layout of each arm contribute to the linear steering feel, superb stability, and exceptional ride comfort of a premium sports coupe.